The government shutdown continues as President Trump prepares to meet with congressional leaders just one day before Democrats take control of the House. President Trump has insisted on including $5 billion for border wall funding before he’ll agree to sign any spending measure. Eight hundred thousand government workers’ lives have been thrown into disarray by the shutdown, with 380,000 workers on furlough and 420,000 who have worked without pay since December 22. The government shutdown continues as President Trump prepares to meet with congressional leaders just one day before Democrats take control of the House. President Trump has insisted on including $5 billion for border wall funding before he’ll agree to sign any spending measure. Eight hundred thousand government workers’ lives have been thrown into disarray by the shutdown, with 380,000 workers on furlough and 420,000 who have worked without pay since December 22. A federal workers’ union is suing the Trump administration over the shutdown. 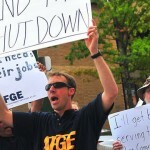 The American Federation of Government Employees, or AFGE, says it is illegal for federal workers to work without pay. Heidi Burakiewicz is lead attorney in the lawsuit, and David Borer is general counsel for AFGE. Far-right former Army Captain Jair Bolsonaro was sworn in as president of Brazil on New Year’s Day. His election marks the most radical political shift in the country since military rule ended more than 30 years ago. Fernando Haddad is interviewed who is a former Brazilian presidential candidate on the Workers’ Party ticket and who lost in a runoff to Jair Bolsonaro. Haddad is the former mayor of São Paulo and served as education minister under former Brazilian President Luiz Inácio Lula da Silva.